He is the Master of Arcane, a knight who possesses great knowledge in the mysterious arts that the commoners call magic. Otokar has lived a secluded life, and over his many years in the Holy Land he has hunted down rare arcane tomes, and visited many sages and wise men. Now, it is finally time for him to use this knowledge to protect his brothers in arms. These sacred warriors of the Order serve as bodyguards and elite warriors, having travelled to the Holy Land under the orders of the Grand Master. They receive unique training and are provided with the finest equipment. Although these vassals will never enter the higher ranks of the Order, they nevertheless fight for their brethren with great spirit and dedication. These crusaders are the volunteer forces of the Teutonic Knights. They are neither vassals nor sworn knights. They may have lacked proper training when they joined the Order, but constant skirmishes on the Holy Lands quickly turn any soldier into an efficient warrior. These nobles hold land granted to them by the Order. Most of them hold lands in the Holy Roman Empire, which engenders in them a sense of brotherhood, borne out on the battlefield. 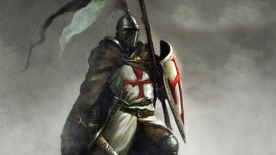 The Order welcomes with open arms any mercenaries who enter the Holy Land and strengthen their forces. True, these mercenaries do not belong to the inner ranks of the Order, but they are provided with the finest equipment. They swore to protect the pilgrims of the Holy Land, and have founded hospitals for the sick. By their actions, they have made the Order of Teutonic Knights a respected presence in the Holy Land. Originally they only defended the ports of Acre, but as the conflict escalated, they have found themselves engaged in the larger conflict.